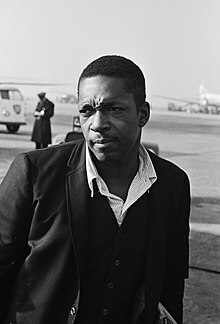 John Coltrane, shown in 1963. I thought about this question. I answered it as best I could [at the press conference]. I felt I didn't tell [the reporter] what I really wanted to say. He thought I was Christian. And I am by birth; my parents were and my early teachings were Christian. But as I look upon the world, I feel all men know the truth. If a man was a Christian, he could know the truth and he could not. The truth itself does not have any name on it. And each man has to find it for himself, I think. Keep a thing happenin' all throughout. In short, [Coltrane's] tone is beautiful because it is functional. In other words, it is always involved in saying something. You can't separate the means that a man uses to say something from what he ultimately says. Technique is not separated from its content in a great artist. John [Coltrane] was like a visitor to this planet. He came in peace and he left in peace; but during his time here, he kept trying to reach new levels of awareness, of peace, of spirituality. That's why I regard the music he played as spiritual music -- John's way of getting closer and closer to the Creator. This page was last edited on 9 December 2018, at 00:00.